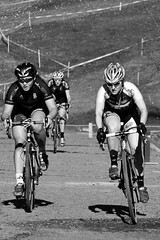 The BikeReg.com MABRAcross Series for 2010 is turning it up to 11. Eleven races, that is. With three new venues joining the ranks, the Mid-Atlantic Bicycle Racing Association’s cyclocross series, MABRAcross, will have ‘crossers toeing the line on almost every weekend from September through November. New to the MABRAcross series are the Winchester Apple Harvest Cross, Hyattsville CX and All Hallows Cross in Hughesville, Md. Along with the new venues, MABRAcross continues to feature some of the most exciting cyclocross events the East Coast has to offer. Kicking off the series is the eighth annual Ed Sander Memorial Cyclocross, MABRAcross’ longest continuously running race. That race is followed by a Western Maryland weekend featuring the Breast Cancer Awareness Cyclocross Challenge and the Winchester Apple Harvest Cross race. The show then heads back to the DC metro region for Hyattsville CX. After a two week hiatus, MABRAcross comes out swinging with DCCX. Featuring the largest fields in the series, the only cyclocross race in the nation’s capital is not to be missed. Starting off November, the long running Tacchino Ciclocross is back to put some funk in your trunk, along with a heaping helping of hurt. Riders can expect a “typical Squadra Coppi course”—fast, a little bit technical in a few places, and a stiff test of fitness and resolve. The show then moves south to Charlottesville, Va., for Urban Cross. This technically and physically challenging course features the “Stairs to Nowhere” and the scenic ruins of the Frank Ix & Sons silk mill. The Howard County Double Cross represents “go time” in the MABRAcross series. Points leaders look to secure their position and challengers look to move up the rankings. The HoCo2xCx weekend starts out fast and furious at Schooley Mill Cross and finishes up with dirt trails and technical goodness at Rockburn Cross. The MABRAcross finale once again takes place in Taneytown, Md. The Turkey Chase is a make or break race. Not only is it the MABRAcross Championship, but it also the state cyclocross championship event for Delaware, Maryland and D.C.
To get the latest info on MABRAcross be sure to follow the Twitter feed: MABRAcross. The series is also on Facebook at www.facebook.com/MABRAcross.